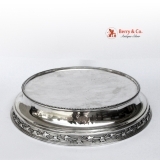 Antique American sterling silver round pedestal plateau wedding cake stand with beaded border and applied ivy leaf decorations, made by Gale Dominick & Haff, New York, 1870-1872. This beautiful stand is 11" in diameter, 13 1/2" base diameter, 2 3/4" tall and weighs 1383 grams or 44.5 ozs Troy, it is monogrammed ABL in a period script. The soft, warm, original finish is present, with no buffing or machine polishing. The excellent original estate condition and clear, crisp detail, with no removals, repairs or alterations, make this an especially attractive offering.